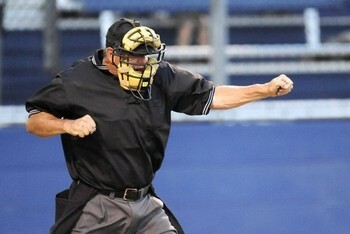 Umpire Training is a three strike process. Umpire Mechanics clinic - This 4 hour session is for umpire only. You will learn basic six of umpire and how to work the field. Rules clinic - must attend one of the two sessions. Take your pick. Who should attend: All umpires, parents, coaches, managers, board members, or anyone who wants to learn about the Little League Baseball playing rules and regulations. Who should attend: All umpires - a requirement. Saturday, February 18th, 2017 - 9am to 1pm - GLL 2 Field. Wear comfortable cloths and shoes. Bring your own water and snacks. If it rains then we will move indoors at the Mendenhall Middle School facility. Agenda: Pick up your umpire gear (shirt, hat, indicator, flag, rules book, etc...), House Rules discussed, Umpire Do's and Don'ts discussed, Ejection document discussed, Introduction to ArbiterSports umpire contact and self assignment system, and much more. Everyone must fill out following forms. 2017 LLBB Volunteer Application - Background check purpose. --- Complete ASAP and before the clinic start date. Every adult (18 years old and over) - new and returning volunteers - must fill out every year. Youth Umpire (<18 years old) do not have to fill this out form. Fill this form out but leave your SSN. Do not write your SSN. Submit your electronic pdf application to me at . Please, sign the printed copy, scan it, and email it to the Safety Officer. We will contact you when we are ready to collect your SSN for background check..
Everyone (youth and adult) must fill this out. You can sign up for the clinics ahead of time or at the walk in. Everyone and anyone is welcome to join us for the Little League Baseball Rules clinic. Learn how the baseball rules and regulations work. Umpire Mechanics clinic is for umpires introduction on umpiring little league baseball fields. Clinics are mandatory for managers, coaches, and umpires. We strongly recommend that you bring snacks/food and water. Paper, Pencils, and restroom facilities are provided. 2016 Little League Baseball Rules books will be provided at clinic at NO cost to you.